xhorizon SR Tactical Molle Sunglasses Case Outdoor Portable Shockproof 1000D Nylon Hard Clamshell Carrying Glasses Case by xhorizon at Sunglasses Tokyo. MPN: RL2018051029A. Hurry! Limited time offer. Offer valid only while supplies last. Material: 1000D nylon hard clamshell glasses case, provides sufficient protection to stop glasses from being broken by lighter pressure. Soft Interior: Double zipper eyeware case with soft interior lining fits glassess perfectly and prevents any scratching to lenses. Extra Large Size Design. Dimensions: 17cm/6.7"*7.5cm/3.0"*6.5cm/2.6". Great for all standard sized and most oversized eyeglasses & sunglasses. Classic design with MOLLE system. 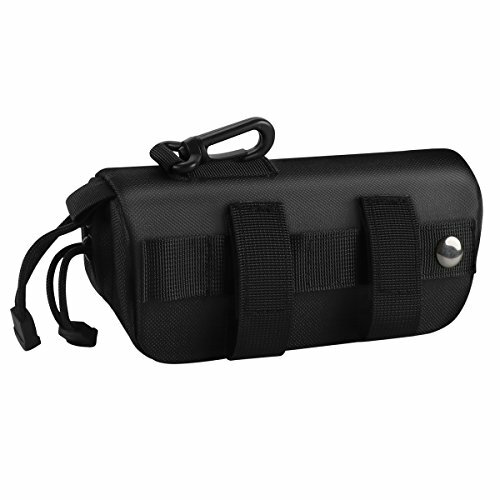 MOLLE style & D-Ring with Snap Hook. Gives a lot of variety to clip on other items like belt, vest, backpack, platform, etc. Package: Only a eyeglasses case. Sole distributor of "xhorizon" products in amazon authorized by brand owner Mr. Lai.